When I was younger, my family didn’t travel a lot. We didn’t have a lot of money, and travel wasn’t something that was a priority for us. It’s not that we didn’t spend time together or go on vacation. We did. But our travels consisted mainly of heading to my grandparents lake cabin for a week or catching a game in the city. When we got a little older, traveling meant heading out-of-town for weekend sports tournaments. It was a wonderful childhood, and I’m very grateful for it. I never flew on a plane or saw the ocean until I hit New York at age 20. I never made it to the beach until age 24. Until then, I didn’t even understand why somebody would want to travel…much less spend the money to allow myself to do so. But, those two trips totally changed my perspective. I’ve been hooked on traveling ever since. Over the past 3 years alone, my wife and I have visited over 13 countries. We’ve also made close to a dozen trips throughout the U.S. as well. It’s been freakin’ awesome. As a couple, we’ve made the decision that family travel is important to us. We’ve been fortunate to be able to bring our kids with us on a few of these adventures. While we’re desperately trying not to spoil them, we are lucky to be able to expose them to new places, people, and cultures when we can. It’s an incredible opportunity for them, and I hope they’ll look back someday and appreciate how unique it is. While we truly believe travel is a way to break down barriers, providing a cultural experience for children isn’t the only reason to travel with family. There are some practical and emotional reasons as well. 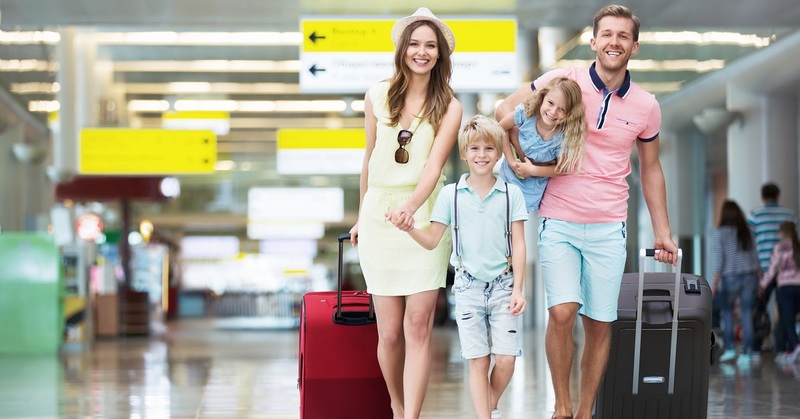 Here are 5 reasons we love to travel with family! Let’s face it. Life gets really busy, and sometimes we don’t always pay enough attention to the people who are most important to us. Traveling always helps our little family reconnect in a way that nothing else does. Instead of rushing to get ready for school or to get another project done, you can simply relax and enjoy being with each other. When we’re on the road, its like everybody in our family reverts back to the best versions of ourselves – our true selves are once again unleashed. It’s great to get in touch with that every few months and connect with each other on a level that doesn’t always happen at home. In addition to reconnecting, traveling is always a great way to make new memories. The memories you make while you’re traveling will bring you closer together in the moment plus form a stronger bond you’ll share down the road. I know our kids play the “Remember when…” game all the time. We’ll often sit and look at photos from our trips and reminisce about how much fun we had. Whether you’re wandering through ancient cities, climbing mountains, or just sitting by the pool, traveling with family is a great way to make memories that you can all share for a lifetime. In addition to traveling with our kids, we’ve been very lucky to travel with both sets of our parents. This has allowed our kids to form bonds with their grandparents that they may not have otherwise been able to do. In the same way we are able to make new memories with the kids, they make new memories with their grandparents as well. That’s something you can’t put a dollar figure on. Something you can put a dollar figure on is your lodging expenses. One of the best things about traveling with family is the ability to save money on lodging. On several occasions, we’ve rented condos and beach houses with my in-laws. By splitting the price of a condo, we’re able to save money on two fronts. Obviously, lodging is less. But, condos and beach houses also have kitchens. Instead of being forced to eat out for every meal, we save hundreds of dollars during the stay by cooking at home. Deciding to make family travel a priority in our lives is one of the best decisions we’ve ever made. Some of the best memories I have are of traveling with my family. What makes them even better is that we can share those memories together. Plus, when you add extended family to the list, it can even make your travels cheaper…and who doesn’t love that?! ?